From historical parks to cracked bells, PA has landmarks galore! Whether you wish to visit the Gettysburg Battlefield or set foot inside Independence Hall, Pennsylvania is your historical haven! Here you can check out all the national landmarks in PA.
As an iconic symbol of freedom, the Liberty Bell was used to represent not only the freedom of colonists, but also as a symbol of freedom by abolitionists in the 1830s. The bell was last rung in1846 as a celebration of George Washington’s birthday. Today, it is visited year round as a historic landmark in Philadelphia. 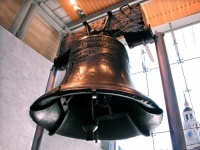 The crack in the bell is a mystery to this day, but feel free to ask Liberty Center educators what their thoughts are on why it cracked! The Liberty Bell Center has taped presentations showcasing the history of Bell. Stop in at any time; no tickets are required! The Liberty Bell is a must-see landmark when visiting Philadelphia! Fourscore and Seven Years Ago! The symbol of the turning point in the Civil War and the inspiration for President Lincoln's renowned speech, The Gettysburg Museum and Visitor center offer a wide-range of options for you to explore when visiting this historical site! A small fee is required to experience the museum's impressive exhibits, view the critically acclaimed film "A New Birth of Freedom" featuring narration by actor Morgan Freeman, and to watch the unique Gettysburg Cyclorama program. Visitation seasons are between April 1 - October 31 and November 1 - March 31. Entry into the park itself is free, but affordable pricing is also offered for free-roaming tours, guided tours, and bus tours. 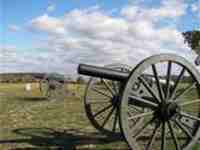 Plan your day trip to Gettysburg National Military Park today! Feel the Electricity of Ben Franklin's Home! Come visit Franklin Court, where the frame of Benjamin Franklin's house once stood. This historical site has several exciting places to visit including an architectural/archeological exhibit, 18th century printing office, post office, and general store. In addition to the above sites, an underground museum exists, but is currently under extensive renovations until approximately June 1, 2013. Don't let that deter you, there are still many other fascinating places to visit in the meantime. Stop in Monday - Saturday from 9 am to 5 pm for an unforgettable experience! Visit the Birthplace of Pennsylvania! 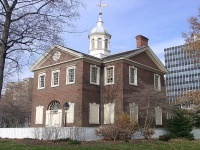 Home of the First Continental Congress, this building is full of history! Many historical figures set foot in this building including Benjamin Franklin and George Washington. Infamously, Carpenter' Hall is also known for the first bank robbery in America! This historical site contains furniture and paintings dating as far back as 1890. Be sure to check out the lists of names displayed on the main wall. They depict the names of the names of the builders responsible for the construction of most of colonial Philadelphia. There is no fee to explore the illustrious history of this landmark. Open Tuesday - Sunday from 10am-4pm, there are plenty of exhibits, flags, and paintings on display. Visit the Famous Flag maker's Home! 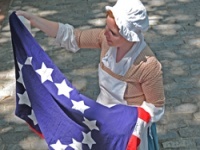 Betsy Ross House has tons of fun tours, programs, and activities to explore! Experience the unique medicinal intricacies Betsy Ross and many other colonial mothers and wives had to develop in order to keep their families healthy. Talk a walk in colonial shoes when you set foot inside her house and workshop! Self-guided tours and audio tours are available at affordable pricing. This site is open Tuesday through Sunday during the months December - February from 10 am - 5 pm, and March through November open daily! No trip to historical Philadelphia is complete without stopping in to see Betsy Ross!